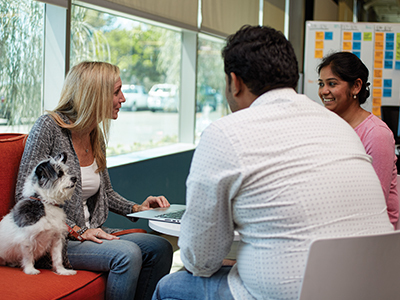 Whether in San Diego or San Antonio, when you join one of our corporate teams, you’ll work alongside people who share your values and commitment. 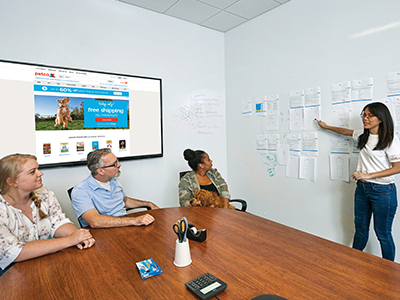 Together, you’ll help drive and direct the future of Petco, from our retail stores to our website, by providing the expertise and support to keep Petco ahead of the pack. 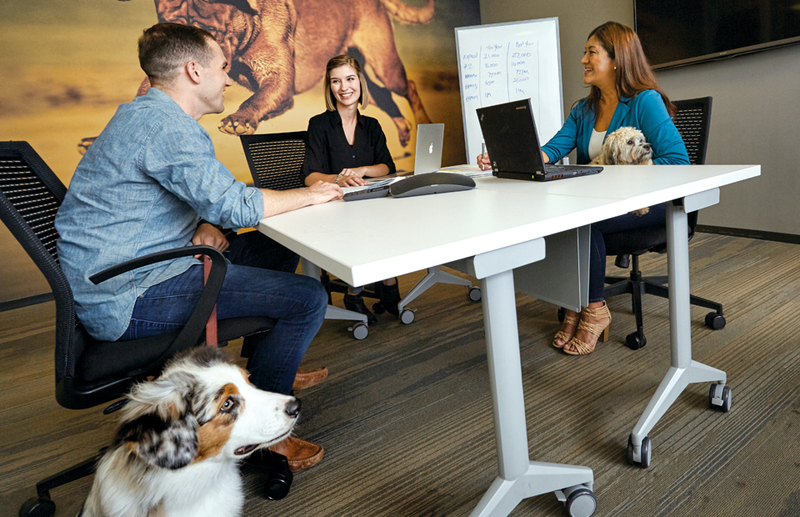 If you’re obsessed with animal welfare, have great people skills, and love to learn, you’ll find like-minded colleagues here, as well as a culture that’s focused on collaboration, support and success. And our continued growth means you can tap into exceptional opportunities for professional development and ongoing learning throughout our organization. Our sustainably built, 300,000 sq. ft. campus expresses our passion for the human-animal bond. It demonstrates our commitment to our partners and the spirit of collaboration that brings our vision to life every day. 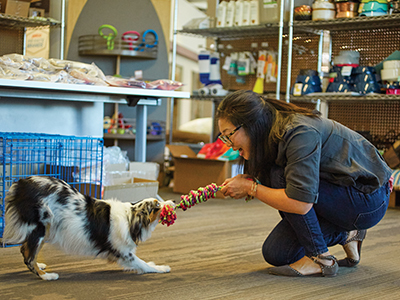 We encourage all our Partners to bring their pets to work, whether they’re dogs, cats, reptiles, or fish. 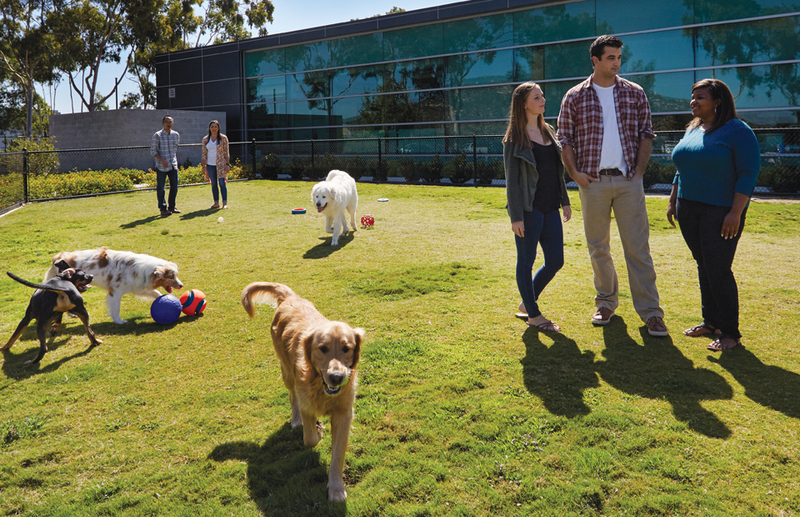 Our beautiful park-like campus features three dog parks, a half-mile walking trail and special workspaces so you can work together and stretch your legs when the mood strikes. We also offer a wellness-enhancing on-site fitness center, an outdoor recreation space, and a full-service café offering healthy menu items. In 2011, we opened our support center here, and we’ve been growing ever since. 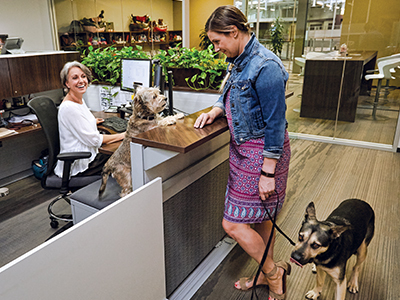 Our people- and pet- and earth-friendly building features an open design that fosters collaboration and communication, and when it’s time to relax, you can visit the gaming and lounge areas, or the corner cafes designed to feel like neighborhood coffee shops. You can also get a workout in at our on-site fitness center. 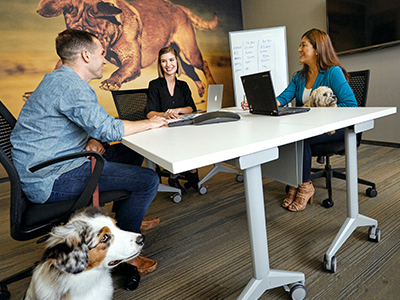 And because we believe having pets in the workplace provides a source of stress relief for our partners during their workday, we offer specially designed cubicles, as well as indoor and outdoor pet play areas. As an accounting and finance professional here, you’ll be responsible for the financial wellbeing of all our companies. You’ll participate in various reporting functions and analysis to track the company’s performance towards achieving its goals. From budgeting to forecasting, and from accounting analysis to contract review, you’ll help keep us moving forward. Roles in this job area include Lead Accountant, Sr. Financial Analyst, and Manager of Financial Planning and Analysis. When you take an administrative job with us, you’ll help support our internal functions, and help drive our external growth. You’ll help keep everything on track throughout our national and international channels, including Ecommerce, B2B and commercial operations. Jobs in this area include Global Operations Coordinator, Merchandise Manager, Operations Process Analyst, and Assistant Buyer of Store Fixtures. In these roles, you’ll lead strategic marketing initiatives and play a key role in crafting and delivering the company’s vision by strengthening our brand position. You’ll work cross-functionally to advance our marketing objectives and keep all our communications on target and on brand. Opportunities in this area include Market Leader, Director of Customer Database and Marketing, Brand Manager, Site Merchandiser, and Social Media & Content Manager. Our success is built on the efforts of all our valued Partners, so when you join us as an HR and Training professional, you’ll perform the very important function of building the teams that help us grow our business and succeed in all areas of our business. With expertise across a broad range of skillsets, you can help hire, train, and guide our Partners to build their experience and achieve new heights of personal success. Jobs in this area include Manager of HR Services Delivery, Employee Engagement & Affirmative Action Manager, HRIS Program Manager, Learning Program Manager, and Manager of Recruiting Operations. As an information systems Partner, you’ll work to keep all our internal systems up and running and make sure our external websites provide our customers with the best possible online experience. You’ll ensure maximum system uptime and performance, and participate in the design and implementation of new solutions and improving resilience of the current environment. Positions in this career area include Senior Network Engineer, Senior Devops/Linux Systems Engineer, Domain Architect, QA Lead, and Data Scientist. The availability of our products is a critical element in our ongoing success, so when you join our merchandising and inventory management team, your work will be an important factor in the positive experience of our customers. 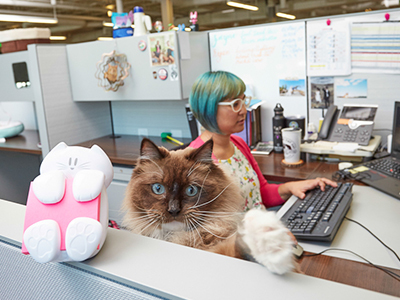 You’ll be responsible for differentiating Petco from the competition, maximizing sales, increasing profit margin, and assuring all goals, strategies and tactics are aligned with the Petco value proposition of exceeding customers’ expectations and financial budgets. And our inventory pros focus on optimizing in-stocks and inventory record accuracy as well as reducing shrink. Careers in this area include Merchandise Planner, Merchandise Analyst, Merchandise Ops Specialist, and Inventory Ops Specialist. In this career area, you’ll partner with merchandising teams to conceptualize, develop, and implement innovative strategies and tactics to help us exceed our customers’ expectations and our own financial budgets with a primary focus on our own brands. When you join our product development group, you’ll work with cross-functional teams to source, brand, package, merchandise, QA, and market new products to offer our customers. Jobs in this area include Product Developer, Digital Product Manager, Product Development QA Engineer, and Product Manager. Want more? 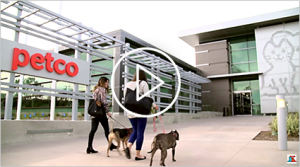 Watch some of our videos to learn more about all the ways enjoying work—and life—at our corporate headquarters. The Petco cafeteria offers an extensive menu of delicious, healthy, sustainable options at an affordable price. Filled with natural light, it’s an ideal spot to catch up with friends over a great meal. Green grass, smiles, and sunshine. 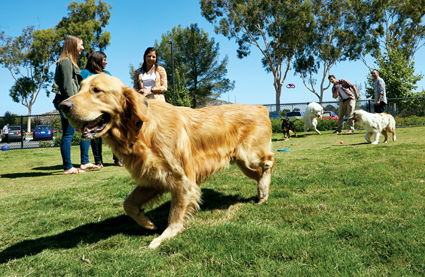 Our five onsite dog parks are the spot for both pets and people to stretch their legs. 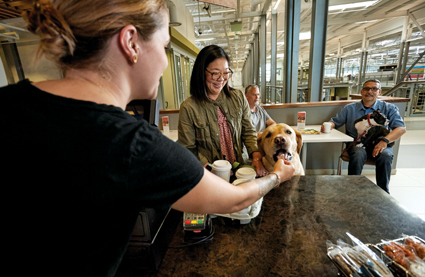 Our onsite Starbuck’s has mouthwatering treats for our two- and four-footed employees! Puppacino, anyone? 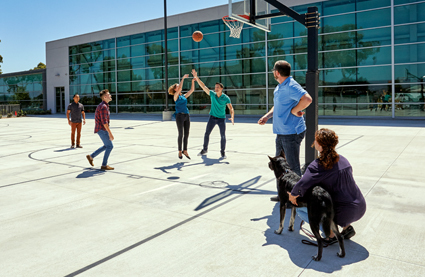 A midday break to shoot some hoops with your colleagues is the perfect way to get some fresh air.